Cristanini | Keeping Things Simple! Bose | More Noise Reduction. Increased Mission Effectiveness. Ring Sights | On Target! 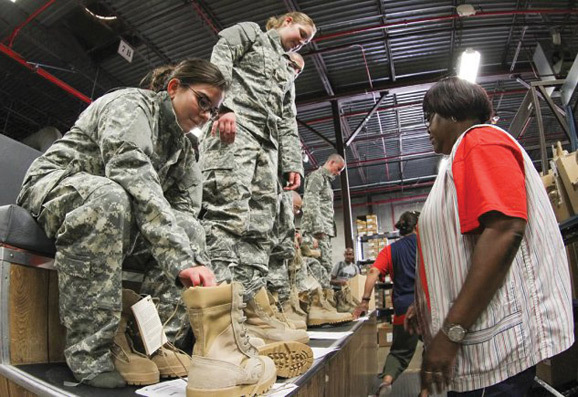 Soldiers try on new uniforms, Courtesy US Army. As the US Army begins to move from desert theaters such as Iran and Afghanistan, and looks again towards more possible jungle action in the Pacific, it is in the process of developing a new jungle boot. Testing of some vendor-supplied prototypes could begin this summer, according to Mortlock. But as far as PEO Soldier is concerned, the most important factor in designing a jungle boot, or any boot for that matter, is the comfort and safety of the warfighter. “These direct attach soles have reduced lower leg injuries to soldiers because they reduce the shock transferred to the foot and leg,” says Mortlock. In other news coming out of PEO Soldier, The US Army is in the process of upgrading its M2 .50 Caliber Machine Guns to the new M2A1 configuration. The upgraded weapon system offers soldiers increased performance as well as new features and design improvements. They include fixed headspace and timing, a quick change barrel with removable carrying handle, a new flash hider that reduces the weapon’s nighttime signature by 95 percent, and a trigger block safety. The M2 “Ma Deuce” is a belt-fed, heavy machine gun that mounts on most aircraft and vehicles, and can be fired from the new M205 tripod. The system is highly effective against light armored vehicles, low- and slow-flying aircraft, boats and enemy personnel. The Army developed the M2A1 to increase the warfighter’s lethality and survivability on the battlefield by providing system upgrades to the M2. The M2A1 includes design improvements that make it easier and safer to use.